For video facilities transitioning from tape to file-based workflows for recording and playback, Ki Pro Rack offers high-quality, ‘ready-to-edit' file capture, designed to get material from source to editorial as quickly as possible. With a wealth of professional connections, Ki Pro Rack will fit right into your existing cabling and routing system and record 10-bit Apple ProRes and Avid DNxHD files direct to removable hard disk or SSD Storage Modules, eliminating the need for time-consuming logging and capturing. The files can be used in most editing systems without the need for additional transcoding or importing processes. For video facilities transitioning from tape to file-based workflows for recording and playback, Ki Pro Rack offers high-quality, 'ready-to-edit' file capture, designed to get material from source to editorial as quickly as possible. With a wealth of professional connections, Ki Pro Rack will fit right into your existing cabling and routing system and record 10-bit Apple ProRes and Avid DNxHD files direct to removable hard disk or SSD Storage Modules, eliminating the need for time-consuming logging and capturing. The files can be used in most editing systems without the need for additional transcoding or importing processes. Big on quality - but not on file size. Recording 10-bit, full raster files, Ki Pro Rack gives you high quality images that easily stand up to post processing requirements - and client scrutiny. Compared to 8-bit recording devices, 10-bit 4:2:2 recording (when supported by the codec) provides better quantization, giving a superior representation of the original scene and allowing for more flexibility in post production when adjusting color and balance. By utilizing efficient ProRes and DNxHD codecs, file sizes are kept in check so you won't need to blow your production budget on extra storage. RS-422 control allows Ki Pro Rack to integrate easily with supported editing systems and external controllers allowing it to fulfill several of the functions of a traditional VTR. Supported NLEs can even perform assemble edits directly to the Ki Pro Rack. Ki Pro Rack’s RS-422 control can also be used to link a traditional VTR with Ki Pro Rack for direct editing control. Use the editing controls on properly equipped VTRs to control Ki Pro Rack for machine-to-machine transfer of video and audio. This allows tape footage to be captured directly as files on Ki Pro Rack without the need for a separate edit controller. Anyone familiar with the operation of a tape deck will feel immediately comfortable when working with Ki Pro Rack. 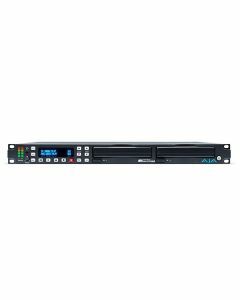 Just like a traditional tape deck, Ki Pro Rack features straightforward and dedicated transport buttons - record, play, stop, rewind, fast forward - making the device easy to operate with minimal training time. The current status of the system and key configuration information is clearly displayed on the built-in screen. Additional operational information can be found in the STATUS menu which can be accessed even when recording or playing back. The Ki Pro Rack operating system offers users a flat menu structure that is easy to navigate with menu parameters presented in clear and understandable language. Ki Pro Rack captures directly to reliable AJA KiStor media. KiStor media are available as HDDs or SSDs in a variety of capacities to best suit the demands of your production environment. KiStor modules also feature built-in USB 3.0 connectivity for direct connection to your editing system using standard interfaces. KiStor media may also be used with the optional KiStor Dock which features a Thunderbolt™ connection for lightning-fast data transfers. Utilizing the rollover recording capability with the dual media drive bays, recording can start on one media module and seamlessly continue onto the second module once the first has reached capacity. This makes Ki Pro Rack ideal for long-form recording needs while maintaining incredibly image high quality.